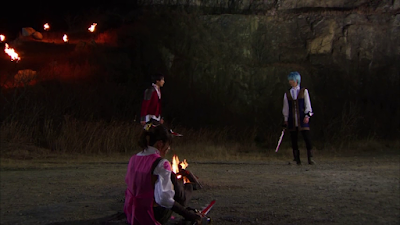 The beginning takes place at the the Ryusoul Temple with Melt, Kou (and he probably shares the same time as Kibaranger) and Asuna. The first three rangres art now given their honourary tasks to take over their mastres. Just in case you didn't notice -- these three mastres art acted by those who appeared in Sailor Moon. We have Masaya Kikawada, Jouji Shibue and Miyu Sawai. These art last decade actors. 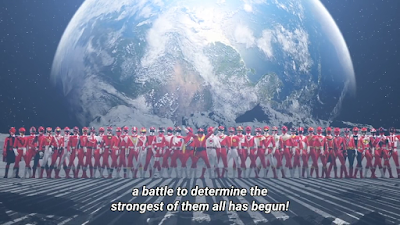 Is this some kind of symbolic gesture that the Heisei era is finally coming to an end or that we have a new generation of Super Sentai warriors? Looks like it! 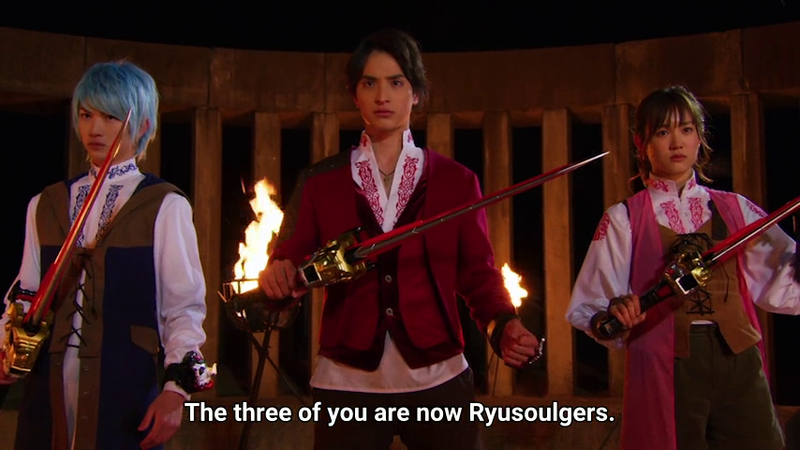 I personally feel like doing the "Well it's your turn now to enjoy Super Sentai. I'm moving on with other stuff." to a new generation. However, I still feel like watching the show to support to an entirely new generation of audience! 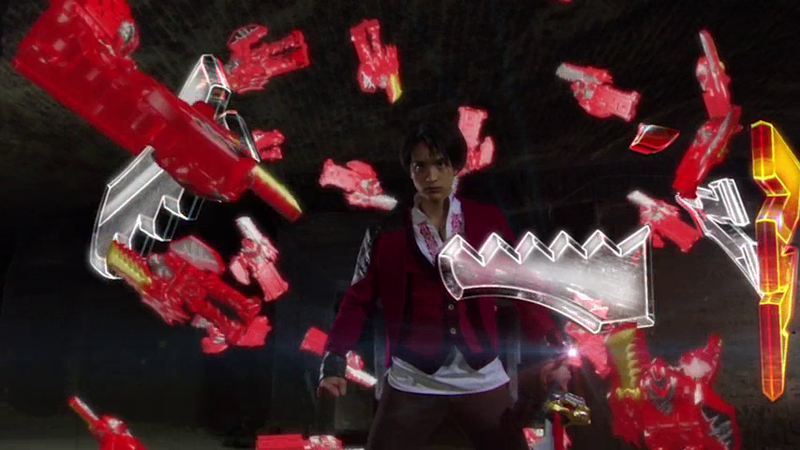 Sidenote, the Ryusoul Kens look WAY SHARPER than those Gaburicaliburs! Here's a bit of nostalgic factor. A mysterious goofy lady (named Ui Tatsui) hears of a fallen kingdom somewhere. Now, she's just lucky she ain't in Jurassic Park yet. What's interesting is that an 8-bit sound can be heard while she's recording herself with a smartphone. It reminds me I use a rotary phone's ringtone for my smartphone! 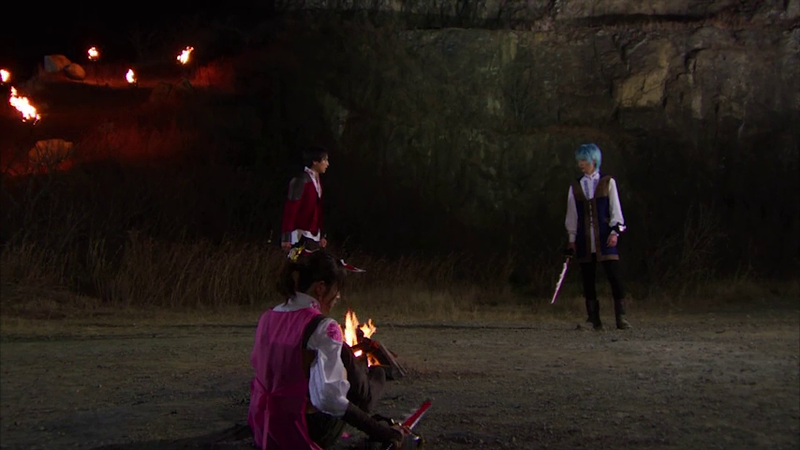 She also runs into Kou who is later scolded by Ryusoul Elder not to communicate with the outside world unless necessary. Hmmm I wonder how life is in their village or rather kingdom? The first two villains Tankjo and Kureon both appear. They do look a lot like RPG villains from Dragon Quest or Final Fantasy. 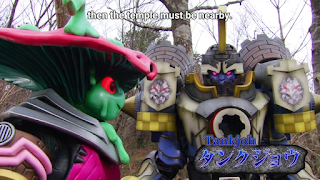 Also, Tankjo is voiced by Joji Nakata -- he also voiced Azald in Zyuohger and the Helheim King in Kamen Rider Gaim (which I seriously want to do a rewatch due to how good I thought it was). For new schoolers -- Nakata also played important 80s human villains such as Kaura (Flashman) and Great Professor Bias (Liveman). Both Ryusoul Reds appear to save Ui from the villains. This also has an exposition of how dinosaurs died according to this series -- it's by meteors! 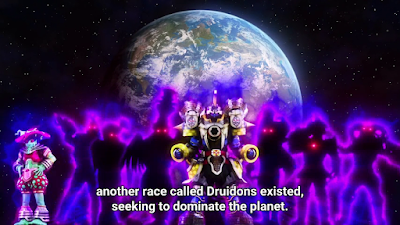 There was the civilization known as the Ryusoulgers and the other known as the Druidons. The Druidons fled the planet after meteors struck though I have a feeling that a malevolent being in involved (and definitely NOT Dai Satan). We're yet to see the Big Bad of the Druidons but I hope he'd be someone like Fractos in Dragon Quest Heroes 2, Shadroth in Dragon Quest Heroes or maybe even the Dragon Lord from the first Dragon Quest game. 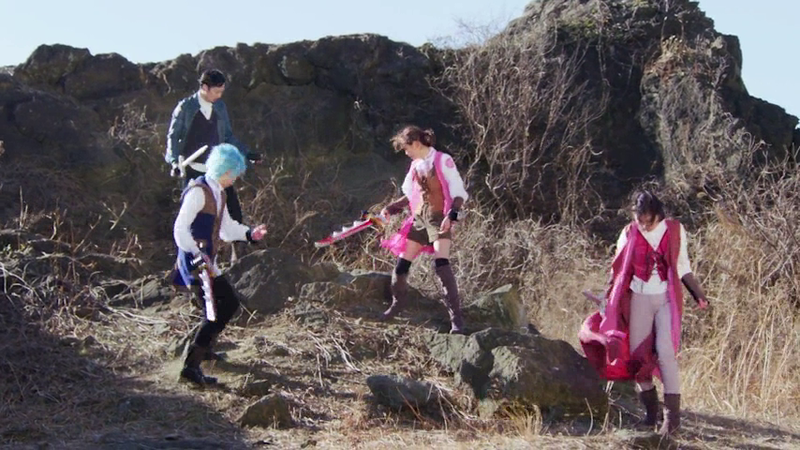 We art getting lots of Dragon Quest vibes in spite of trying to become a dinosaur Super Sentai. Now for a bit of exposition. 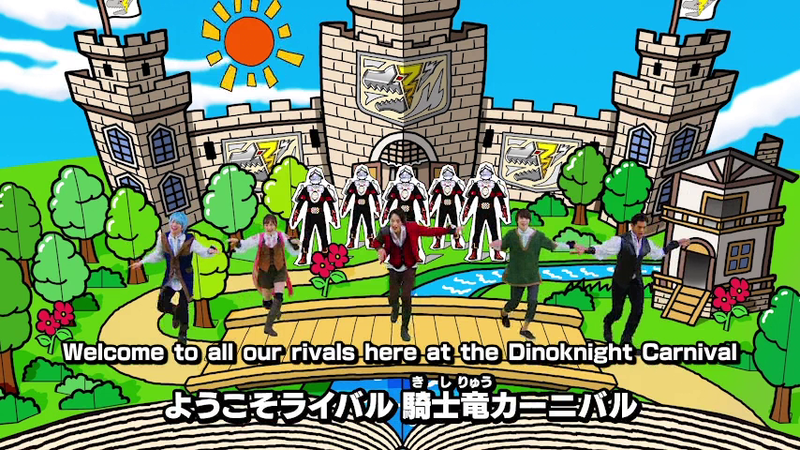 The Ryusoulgers art now training. There's one thing that Asuna is ashamed of -- it's that underneath her feminine exterior is that she has rather masculine strength like Wonder Woman. Oh for Toku we do have Hina Izumi from Kamen Rider OOO and for Power Rangers fans -- they did have Katie in Time Force. Ui entereth into the secret place which causeth some trouble. 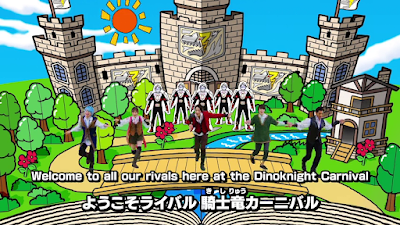 I just really wonder why the Ryusoulgers art so emo about outsiders. The Ryusoul Elder ordereth her out. Kou does try to erase her memories but disaster striketh the fallen kingdom. What was probably meant to be a lighthearted episode has a dark start. First, the temple getteth attacked by the Druidons then we have the Ryusoulgers losing their powers. 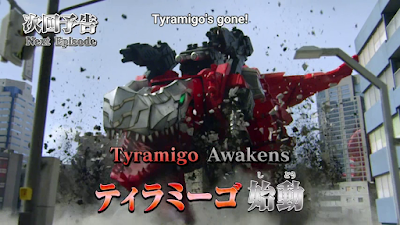 What's even MORE SAD is just how the three Ryusoulger mastres died. I don't know if Toei is going to suddenly pull like what they did with Hyuga in Gingaman by actually making him "missing"and making him return or not. I hope that regardless of whether or not they will stay dead or return alive -- I hope that it'll be well-written regardless what the writers choose. 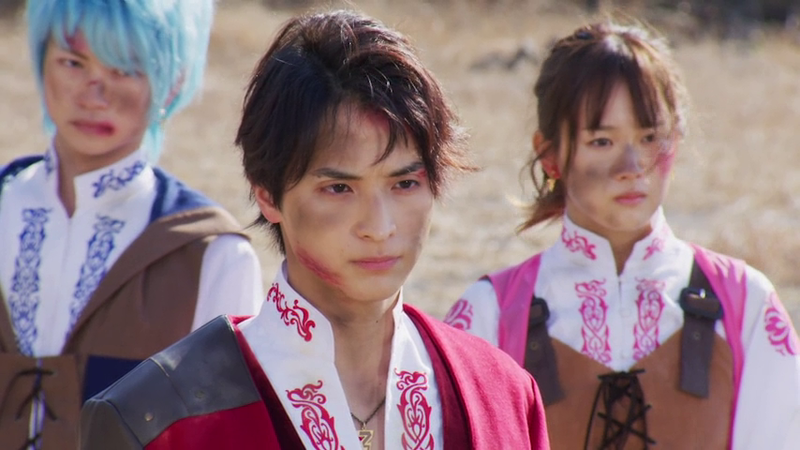 Kou doeth something similar to the "Super High Tension" in Dragon Quest before he becomes Ryusoul Red in place of his mastre. I feel some Ultraman vibes with the Dragon Minosaur in the first episode. While dragons won't be the theme but this is really throwing back to Dragon Quest. A knight-like mecha appeareth with Ryusoul Red piloting it. He manageth to pilot it and finish the first monster. Is it me or art the first episode monsters of the week usually meant to be just destroyed and that they art pushovers as far as the rangers art concerned? Sure, they art dangerous but they tend to be too easily disposed of, right? 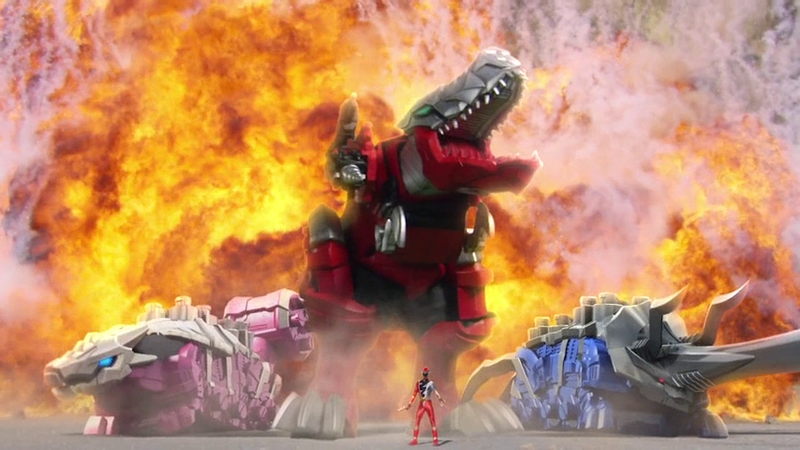 The mecha separateth into three dinosaurs. I really want to comment at how the triceratops nearly looks like a Medieval legendary monster is with a much longer horn. We also have pink with an ankylosaurus -- which probably fits her well due it its strength. 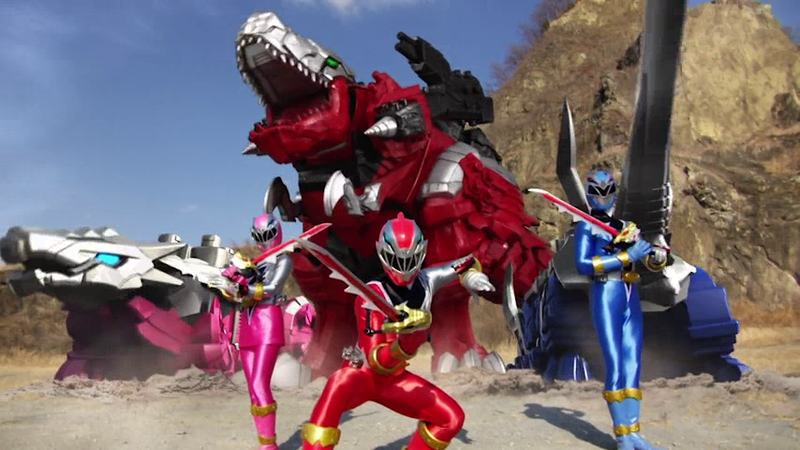 IMHO, these mecha art better designed than Kyoryuger and maybe Abaranger. 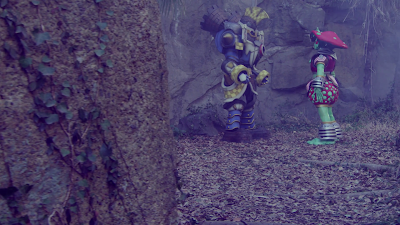 As much as I like Abaranger for its storytelling -- I still think their mecha looked like they were meant for Barney and Friends. The mecha here feels like that they were designed for medieval times! I just have a feeling that they still need to learn how to combine it or master it before all three can harness its full power! The three heroes art then told by the Ryusoul Elder that even without the temple -- they have gained the power to become Ryusoulgers. 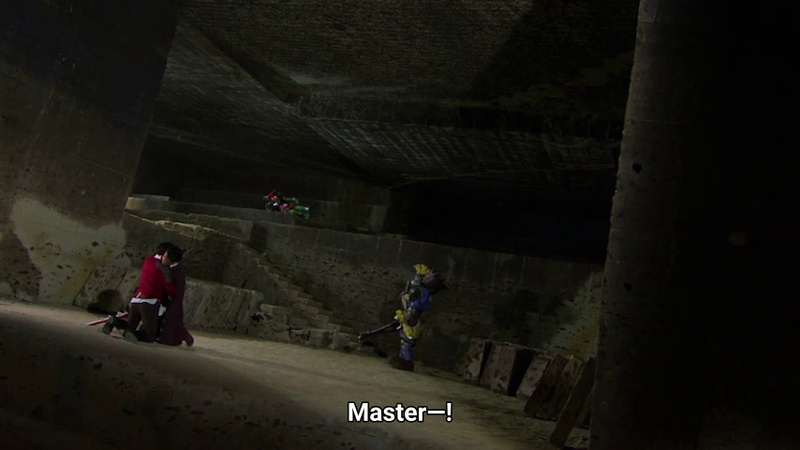 They art told that they must find their comrades who did appear in Super Sentai Strongest Battle. The two siblings art yet to appear in human form but we know they left the village some time ago. I can't wait to see them appear in the flesh next week and do combat! The credits does really throw you back to Medieval times than the stone age, doesn't it? You can see a castle. The mooks look like European knights. Granted, we do have Kazuhiro Takahashi as its producer -- he is actually involved with plenty of Anime so I guess that's why we art getting the Anime feel. 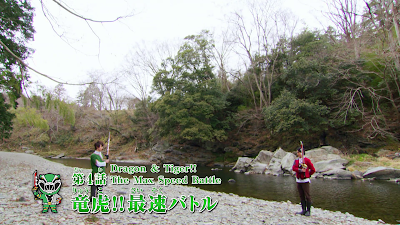 The writer for this one is actually a J-Drama writer trying his shot at Super Sentai -- hopefully, I'll get plenty of drama aside from action. So I wonder how will this quest for new ideas work out? Well just keep the bar low and give moderate praise and criticism is what I'd probably do with the rest of the series. Next week should be interesting. We may or may not see the Gattai sequence yet. 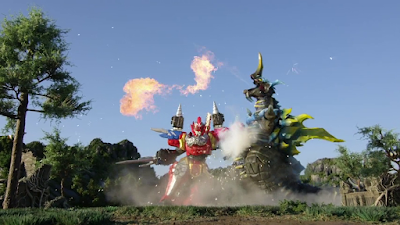 I dunno why Toei right now is showing the whole robot first then splitting it up. Do you remember that happened in the now disbanded Super Robot Anime when Combattler V and Voltes V were introduced whole before they were introduced to their components? Also, Bioman first brought us Bio Robo before the components of Bio Robo, right? Now, let's just wait for next week!